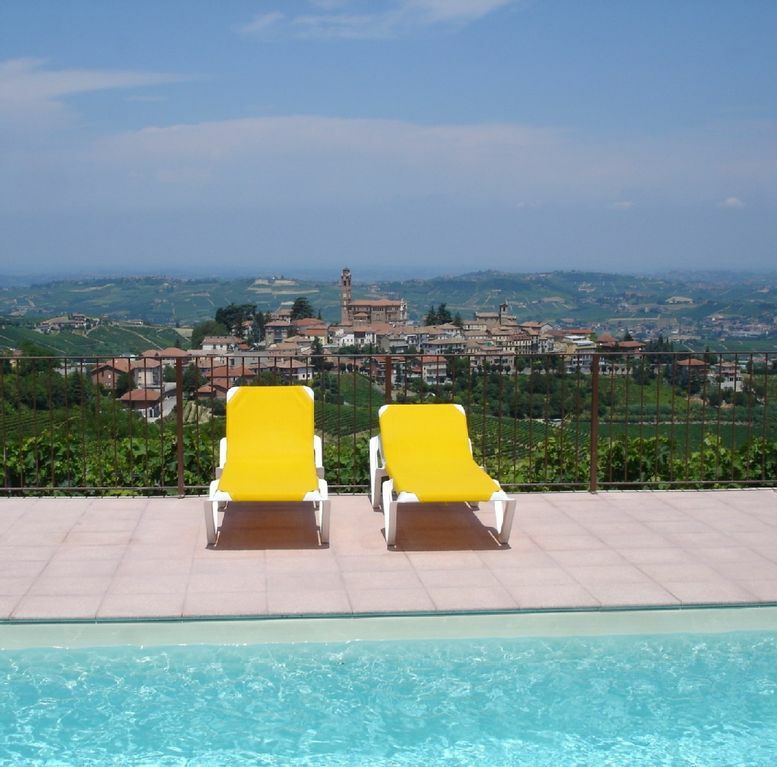 Large house to rent in Piemonte, UNESCO world heritage, 2 story house located on the top of a hill. It has Amazing views, beautiful place to relax, lie by the pool, mountain biking/hiking, great food, local bar, huge eat in kitchen with a terrace all around the house , overlooking the valley. SMART tv and satellite and DVD and WADSL wifi internet throughout. The house is 400sq meters so enough space to have some quiet time if you are with a large group. Wheelchair and Child friendly and a secure play pen has been made next to the pool. There are also child items available such as 3 cots, 2 playpens high chairs, fold out bed, strollers etc. and babysitting can be organised. Swimming pool 12mx6m sunheated. The house can hold families as there are 5 large bedrooms, 3 x double beds & 6 single beds + 2 extra beds should these be needed. The house is also suitable for a wheelchair as there is also an invalid shower and toilet on the ground floor and special ramps are available. The house is located between Genua, Turin and Milan airports the house is situated in the middle of the Italian wine region Langhe, Barolo, Barbera, Barbaresco etc...so enough wines to be tasted. The region has not been spoiled by tourists so if you want to be in a place where the menu's are not in English but still in Italian, come and discover Piemonte. Golf, mountain biking, walking, wine, horse riding.The area is has quite a few golf courses, the oldest 36 hole golf course is located near Asti, approx. 40 min drive. If interested in Golf I can provide you with some links to all the golf courses in the area. The area is very suitable for walking and cycling a lot of hills though! The whole area is wonderful to discover!! Piemonte is also famous for their wines and truffels therefore there are many cellars/stores dotted around the area. The hilly landscape, the cuisine, rendered varied by the range of culture and small farms , and as there is a big monumental heritage this area will want you to come back again and again and now being part of the UNESCO world heritage it will remain beautiful. Each season here is wonderful, starting from spring with its great burst of colour and all fruit trees full of fruit and views offered by the vineyard dotted hillsides. Summer has a breezy climate and preludes the glory of the harvest of a very tasty aromatic grape. Autumn generally in October shows the arrival of the white truffle and all local wine festivals. Swimmingpool: This private swimming pool 12x6 meters has a fence around it to keep children away from the pool. There are swimming towels available and 12 sun loungers. The swimming pool has an area of shade on the garage side for those needing this. There is a shower and toilet next to the swimming pool which is located in the garage next to the pool. There is a ping pong table in the garage and a trampoline with a safety net in the garden. There are side tables next to your sunbed. The pool is heated by the sun and is wonderful. It is normally opened towards the end of May and closed in September depending on the weather as it is heated by sun only. It will be cleaned each week by a professional pool company and there is a net next to the pool for removing a leaf etc.. Please do not sit on the sofa's in the sittingroom with wet swimming outfits. Play items are to be used with caution and at own risk. After having studied Italian in Florence I decided I wanted to find an old building to renovate and when i found this I fell in love with the view. There where 4 walls and everything else had to be done to the property from water, electricity, gas, roof, floors, windows etc...i rebuilt a house inside the wine storage place and loved doing it. The view and location, it is difficult to find properties that have some flat ground and i wanted to avoid the zona rossa (planes fly over with spray for the vines) this property location was perfect in a UNESCO area and the view is spectacular, the project was much larger than i was planning but this location is unique. Come and see it and most of all enjoy it as much as we do every single visit and throughout all the seasons. Towel radiator in all bathrooms, 2 hair-dryers in the house. There are 2 central heating systems, one for upstairs and one for downstairs. Linens are provided and are laundered by a company located in Canelli, cost is included in end of tenancy cleaning/ laundering fee. Ping pong table, wood and shower and toilet for the pool. Washingmachine is located here. Rural garden and drive, large courtyard to park cars. Fruit trees Vigs, Prunes near the main gate, then near the trampoline we have apples, apricots, peach, cherry which you can all eat. There are special ramps made in the house for wheelchair access from downstairs bedroom to the bathroom into the kitchen/diningroom to the sittingroom and onto the terrace and all the way to the pool. There is a ping pong table which is located in the garage and can be used and some badminton sets. There is now a trampoline in the garden max. 120kg. Only plastic glasses, bowl and plates can be used by the pool. There is a large table outside where you can eat and watch the pool. The barbeque can be used but must be cleaned prior to leaving. There is a washing line to dry your laundry and swimming towels. The rubbish recycling has now started in Italy so please ensure that all your rubbish has been disposed of prior to leaving. Any rubbish left will be fined with 50 euro. A wonderful stay in a spacious, well equipped house. The owner was extremely prompt in correspondence and in ensuring our specific needs were met. We had a great time, and the house worked well for me, in a wheelchair, my son of one and a half, and my husband. Everyone loved our stay. Geweldig huis, zelfs als je in de keuken staat waan je je in de wijngaarden van Piemonte. Op alle tijdstippen van de dag heb je een prachtig zicht op het schilderachtige Castiglione Tinella. Een licht en gezellig huis met een groot zwembad. De keuken is heel ruim, van alle gemakken voorzien, een echte familiekeuken, De slaapkamers zijn alle ook zeer ruim. Het huis is groot genoeg om hier de vakantie met 2 families gezellig in door te brengen. In een straal van 10 km vindt je al verschillende wijnproeverijen. We hebben heerlijk geshopt in Milaan (1 1/2 uur rijden). De mooie en authentieke dorpjes zoals Asti en Alba zijn ook zeer makkelijk te bereiken. We genoten van de heerlijke Piemontese streekgerechtem in de nabije omgeving. Zelfs in Castiglione Tinella is er een geweldig restaurant (Verde Rama, wel even reserveren).In Santo Stefano Belbo (15 min) kun je terecht voor heerlijke koffie en goede lunch en diners. Wij zijn daar regelmatig naar verschillende restaurantjes geweest en werden telkens weer verrast. It was a great house with am Amazing wiew! When We arrived the heating wasn’t working, but the caretaker of the property fixed everything! Good service. The house was clean and the kitchen had all We needed to make great family dinners. The pool area was clean and evertything was in good shape. We will definitly be back! The best house I've ever rented - yes, I mean it. It's simple. I'm 51 years old, British and pretty fussy ... and have been looking for lovely places to holiday for, roughly, 30 years. This is the best holiday house I've EVER rented. The house itself was absolutely fantastic in terms of layout, facilities, bedrooms etc ... we had a family party of 7 people for one week, with an age range of 7 - 90. Yes ... an 83 year age gap ... and everyone was so happy to be there. The rooms and bathrooms were absolutely perfect for old and young alike. But the best thing of all was the view. I cannot possibly describe by email the beautiful pool, the shaded patio, the silence, the gently rolling hills, the hilltop villages, the endless vineyards and ... THAT view. Simply incredible. There are no catches whatsoever. I would go again tomorrow. And, no, I have not been paid to write this review ! I keep coming back to this wonderful house and the beautiful landscapes surronding it. Can highly recommend to stay at this house. If you love good food and wine, Piemonte is the place to travel, a must see. Spacious house, excellent for families or get together. Private house, garden including a private swimming pool. The house is fully furnished and includes SMART TV and satellite, DVD and WADSL WIFI wireless internet. Child friendly house and includes a ping pong table in the garage and a trampoline ioutside with safety net as well as a new climbing, swings and slide playframe. The house has a fireplace for winter and is cool in summer. There is a downstairs bedroom very suitable for the elderly or for wheelchairs including handicap shower/toilet ground floor. The satellite has cartoon network and English,German,Dutch and French programmes. There is a separate shower and toilet near the pool. The pool has a fence around it. Items such as baby bed, play pen, strollers and high chair, fold out bed may be used for the duration of your stay at no extra cost. Washing machine located in the garage. It is a lovely area and the house has beautiful views over the vineyards. A car is necessary as you are located on a hill. Plenty of food shops all within a short drive. Other Activities: golf, shopping, food, markets, reading, sleeping, eating. Golf: There are a lot of golfcourses dotted around, there is a book in the cupbard about all the golf courses in Piemonte. If you are in the house you can also ask Lorenzo (Bar Roma owner) which courses he prefers as his handicap is 10 and he plays every thursday (his day off). Ski: You can go skiing in the mountains near Turin which is an hours drive so you could go for a day's skiing should you wish to and come back to a wonderful house with a fireplace and a huge kitchen/dining room (16,5 meters long). Rental is based on average group size normally approx. 10 people send me an email and I will confirm the rental total for your group per week sometimes no charges for kids/babies. Only private use/no sharing with other groups. Pets allowed with prior approval. For smaller groups a price could be requested so please send email. Cleaning/Laundering on departure fee is normally approx -200 euro and will be deducted from the deposit prior to refunding the balance the week after your departure. A fine will be given if rubbish is not properly disposed of as per the instructions which you will receive prior to arrival, fine is 50 euro. Also you will get a form to complete with your name and those of the group which is for the comune to comply with the anti-terorism law to let the council know you can stay, same as giving your passport with the hotel reception.